Let’s face it: Starting your law practice as a new associate can be stressful and overwhelming. Beyond mastering a specialized area of law, which you might not have even studied in law school, you also have to learn the actual practice of law, as well as navigate the daily social, ethical, and legal pitfalls inherent in any firm. Although there are publications that can help you understand the nuances of the different areas of law, they might not teach the practical skills that you need to survive, prosper and grow in the profession. 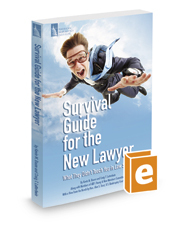 Survival Guide for the New Lawyer: What They Didn’t Teach You in Law School fills this void by providing real-world guidance on the everyday aspects of practicing law, with a special emphasis on bankruptcy law. Full of anecdotal examples and hard-earned advice, this guide is perfect for the aspiring lawyer fresh out of law school, or for any firm that wants to give its associates a leg up on the competition.